It wasn’t an easy climb. Our son Peter had told us that before we started. “No fourteener is easy, Mom.” We were in Boulder visiting our son and daughter-in-law this past weekend, and we decided that it would be fun to drive up into the mountains and hike one of those glorious over-fourteen-thousand-feet-high peaks that jut up into the Colorado skyline. Pete and his wife, Shelly, chose one for us, one with a shorter distance to the top — just in case those afternoon thunderstorms rolled in. And now on the way down, I concurred with Pete. 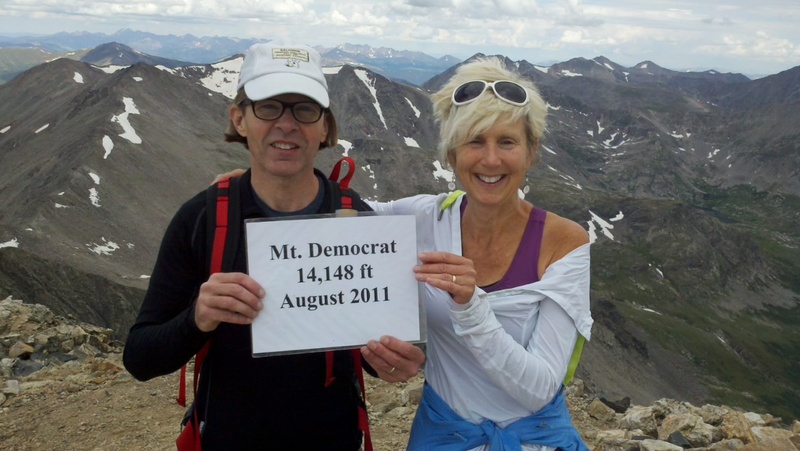 No fourteener is easy. From the trailhead, gazing up into the morning sun, it had looked like a piece of cake, a pointy perfect mountain-shaped piece of cake. In fact, I had been so bold as to say to Pete and Shel that perhaps we could skidaddle our way over to that second peak and conquer two fourteeners in one day. They had laughed, a knowing something I didn’t know kind of laugh. I lost my bravado two minutes into the climb. At the trailhead, we were already breathing hard into the thin air of 12,000 feet and my skidaddly toes were nowhere to be found. Besides, shortly into the venture, the river path of packed mud and pebbles with its wildflower border, transformed itself into a steep often loose rocky mass of boulder after boulder, barely a trail at all. It had taken hours of huffing and puffing to will our way up to that summit. And, as we started our descent, we were not a cohesive group. Shelly, in her floppy hat and fuchsia sweatshirt, had seemed to fly up that mountain, and now was flying back down ahead of us. And Cam and Pete were behind me, on the top still, fortifying themselves with nourishment before the journey downward. So here I was alone, just after noon, with the dark clouds, billowy and ominous-looking, blowing in, just minutes into my downhill journey. I was placing one foot in front of the other on loose boulders, approaching the scary part the trail, the spot I where I had freaked out on the way up, looking down at the knife-edge where the world dropped off on both sides, when the first clap of thunder slapped me in the face. Here I was alone, facing two of my biggies, a fear of heights and a fear of being struck down dead by lightning. And I have to say that my second fear seemed justified. This whole adventure, that in this moment I was thinking was really stupid on our part, was above tree-line, and we, the four of us and the other stupid people who were climbing up and down this mountain, were rods for this approaching lightning. It was then in my moment of panic that I remembered another time recently that I had felt the same way, this sick-to-my-stomach terror. It was a month ago, as we bumbled our way through the French countryside in our motorhome during our week at the Tour de France. I was navigating, had found us a shortcut, a road that looked great on the map, winding its yellow line in the direction we wanted to go. “Let’s take the one that’s yellow on the map. It’s a shortcut,” I had said to Cam. And Cam, trusting my skills of navigation, amiably turned our home-on-wheels onto the Road-from-Hell. It wasn’t a yellow line at all. And it certainly was no shortcut. It was barely even a road, with its one and a half lanes and its lack of guardrails and its oncoming traffic and its steep mountain drop-off on the passenger side. I moaned as Cam drove. I shook at my core. I looked straight down at certain death. For twenty minutes, until Cam somehow got us off my yellow-lined horror, I was petrified. And, even during that primal terror, I knew it, I said it out loud, that I didn’t want to die scared. So, as the thunder continued to rumble, then crack, as I found my way over the knife’s edge, I said to myself, “This is my chance for a do-over. If I’m going to be struck down by a bolt of lightning today, I’m going to die happy.” I started saying it through the terror of the black cloud hanging over my head. “Fun is fundamental fun is fundamental fun is fundamental,” I said it over and over again. And I started believing it. I started getting excited about the thought of a do-over. I started breathing deeper. I started feeling lighter in my feet. I found my scrambling legs, the ones I used as a kid on the rocks in Maine. I began passing people. The little mammals that I think were picas squeaked at me from under the boulders. I noticed a bird, a sweet warbler-looking bird, who landed on a rock nearby. I began to smile, saying hello to people. Shelly, the little spec of fuchsia in the distance began to take human form. I was catching up with her and behind me I heard the voices that carried through the thundery air; Pete and Cam, they, too, were making their way down. And the rain, hail actually, didn’t start until the parking lot and our car were in sight. I pulled out my raincoat. How smart of me, I thought, to carry a raincoat. And the asters, bright purple, and the Indian paintbrush, a brilliant red, looked even better in the dark wet of a thunderstorm afternoon. And although there was lightning – Pete and Cam saw it flash before them, I was low enough by that time that I didn’t even notice. And when I got back to the car, still safe in my body home, I could honestly say, I could honestly say that I was having fun, that I was really having fun. Comments Off on If it’s not fun; why do it?! ?